Wahunsenakah Lodge 333 of Newport News, VA held their annual Holiday Banquet December 6 at the Yorkminster Presbyterian Church. The theme of the banquet was "Saluting Our Military," and featured keynote speaker Lieutenant General Keith Walker, who as a youth was an Eagle Scout in Troop 31 of Fort Monroe and an Arrowman in Kecoughtan Lodge 463. After graduating from West Point, LTG Walker served for over 38 years in command and staff positions at the tactical, operational, and strategic levels, with assignments in Iraq, Kuwait, Kosovo, Bosnia, Germany, and Belgium. The oval patch for the event completes the series of Wahunsenakah activity patches saluting the military in Hampton Roads. It features a Scout color guard on a white ghosted background. You can view all of the 2014 and prior activity patches here. Wahunsenakah Lodge 333 of Newport News, VA held their Fall Fellowship weekend October 24-26 at Bayport Scout Reservation. 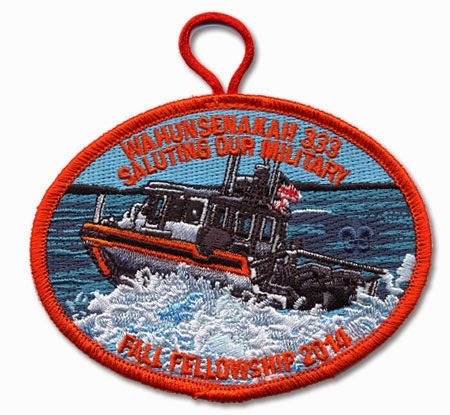 Continuing their 2014 activity patch theme of saluting the military, the emblem issued for the event pictures a Coast Guard response boat. The Lodge will conduct it's final activity of the year on December 6 when Wahunsenakah Arrowmen will gather for their annual Holiday Banquet. Wahunsenakah Lodge 333 of Newport News, VA held their annual Summer Service weekend on Sept. 12-14 at Bayport Scout Reservation. 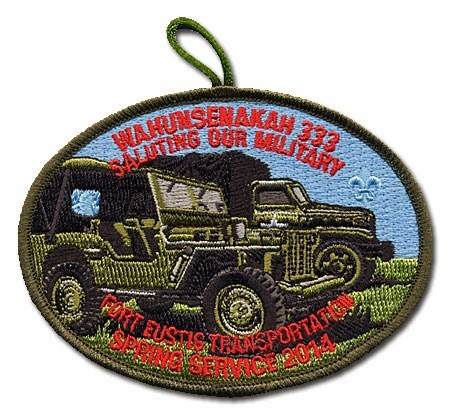 The patch issued for the event continues the 2014 theme of saluting the military installations in the council area. 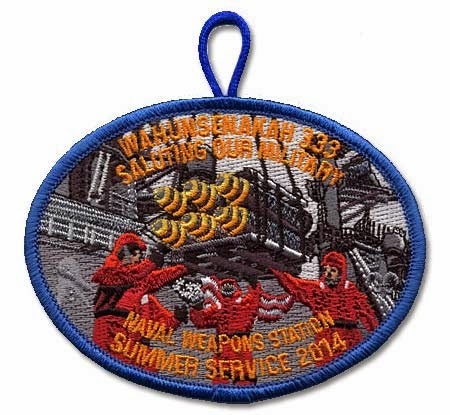 The solid embroidered oval emblem recognizes the Naval Weapons Station in Yorktown. Wahunsenakah Lodge issued their first activity patch of 2014 for their Winter Service Weekend, held Feb. 21-23 at Bayport Scout Reservation. 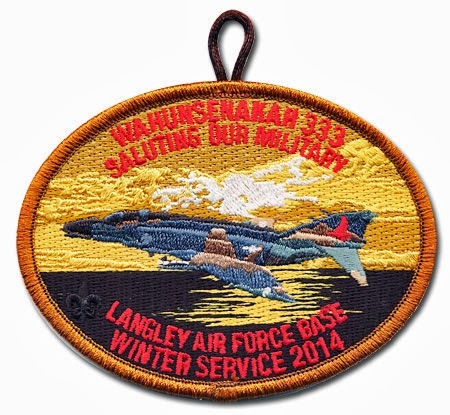 The solid embroidered oval pocket patch with attached button loop pictures an F-22 fighter jet against a sunset over water background, with "Saluting Our Military - Langley Air Force Base" lettering in addition to the Lodge and event names. Recognizing the military is an especially appropriate theme for the Lodge's 2014 event patches since the Hampton Roads area the council serves (along with neighboring Tidewater Council) has the largest concentration of military bases and facilities of any metropolitan area in the world. Nearly one-fourth of the nation’s active-duty military personnel are stationed in Hampton Roads (Wikipedia). Established in 1916, Langley Air Force Base is one of the oldest continuously active air bases in the United States. Today it is headquarters of the Air Combat Command and home of the 1st Fighter Wing whose 27th Fighter Squadron and 94th Fighter Squadron fly the Lockheed-Martin F-22 Raptor. Wahunsenakah Lodge 333 held their final activity of 2013, the Holiday Banquet, on December 7 at Trinity United Methodist Church in Smithfield, VA. To commemorate the occasion a large oval pocket patch with attached button loop was issued that continues the theme of prior 2013 event patches featuring ceremonial team members. 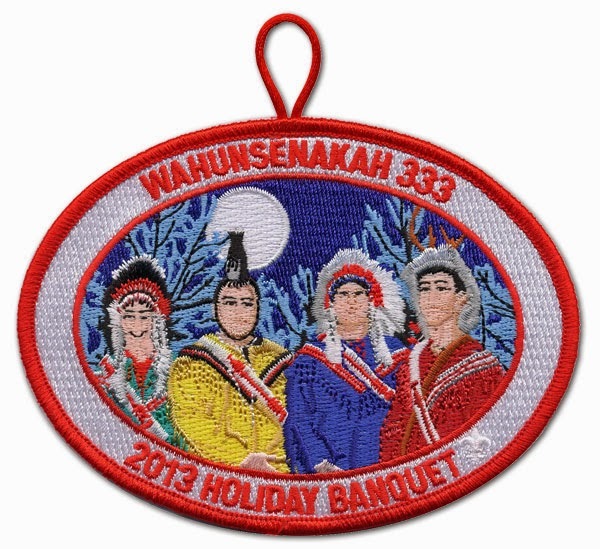 The Holiday Banquet patch includes all four of the characters from the Ordeal ceremony. From left to right: Nutiket (Guardian), Kichkinet (Guide), Allowat Sakima (Mighty Chief), and Meteu (Medicine Man). These characters were featured on the Summer Service, Spring Service, Fall Fellowship, and Winter Service patches, respectively. You can view pictures of all Wahunsenakah activity patch issues here. The OA History Timeline has a wealth of fascinating information about the history of Order of the Arrow ceremonies. Check it out. Since 2004 Colonial Virginia Council has awarded a special patch to donors who contribute $75 or more to their annual Friends of Scouting campaign. 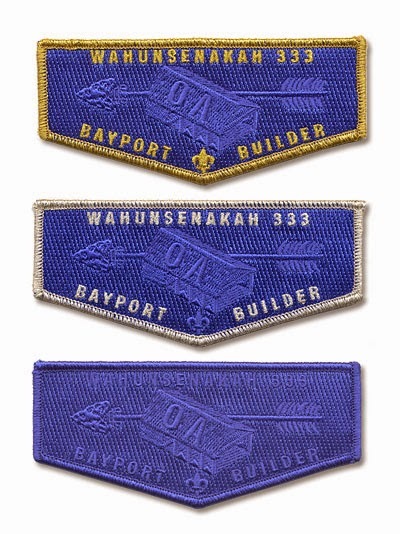 Each of the patches has represented one of the points of the Scout Law. For 2014 the theme is Clean, represented by a completely white shoulder patch with white lettering and centered fleur d'lis ghosted into the white background. FOS contributions are a vital part of the Council's operating budget. Please consider a donation to help perpetuate Scouting programs across southeast Virginia: View/Print 2014 Friends of Scouting brochure. 2015 will mark the completion of the Scout Law theme, with Reverent. View all of the Colonial Virginia Council Friends of Scouting CSP's issued to date here. 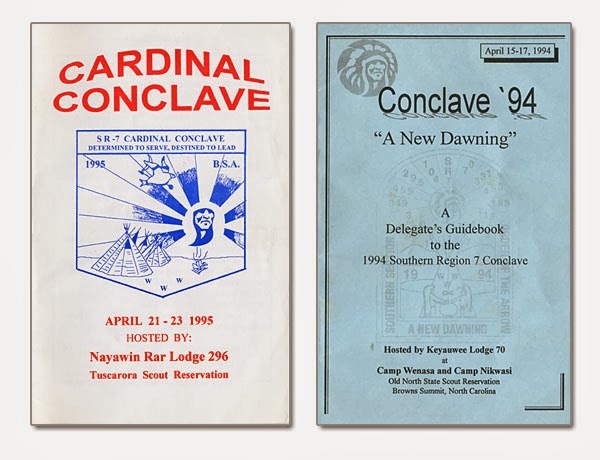 Recently I acquired Delegate Guidebooks for the 1994 and 1995 SR-7 Conclaves, and have posted them to the associated conclave pages at va-oa.org. Section SR-7 was short-lived. It was created in 1993 when the BSA consolidated the six region structure to four, in the process splitting the Virginia OA Lodges of SE-8 between the new SR-6 and SR-7. Tutelo 161, Shenandoah 258, and Shenshawptoo 276 joined 4 Lodges from Kentucky, 4 Lodges from Tennessee, and a Georgia Lodge to form SR-6, while Nawakwa 3, Blue Heron 349, Kecoughtan 463, and Chanco 483 were sent to SR-7 to join 10 North Carolina Lodges. This arrangement proved to be too unwieldy, so four years later the Virginia Lodges were reunited in SR-7A, with the Carolina Lodges comprising SR-7A. At sunrise on Feb. 2 the Chesapeake Bay District of Colonial Virginia Council held their annual Scout Sunday services at the Yorktown Victory Monument, with breakfast following at the US Coast Guard Training Center. A multicolor commemorative pocket patch was issued very similar to prior years with the same design but changes to the colors. This year's version features a purple border. 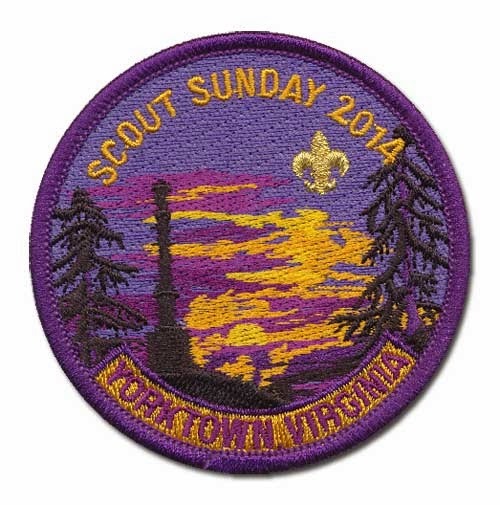 You can view Scout Sunday patches from 2001 through 2014 on the Colonial Virginia Council - Other Emblems web page. Thanks for Larry Johnson for the photo of the 2013 Scout Sunday patch.